North Georgia Cabin Rentals Bikers and Hikers enjoy the natural setting of Barnes Creek. Cute 2-Bedroom / 2-Bath Cabin with Sleeping Loft in Ellijay, Georgia. Near Bear Creek Trail, The Gahuti Trail, Fort Mountain State Park Trails, Mulberry Gap. Cozy 2 Bedroom 2 Bath cabin with sleeping loft in Ellijay, Georgia. Huge 6 Bed Room Cabin on a Large Lot with Game Room, Fire Pit & Hot Tub. 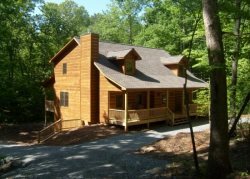 Barnes Creek Retreat is a 2 bedroom 2 full bath cabin on 1-1/2 secluded acres. 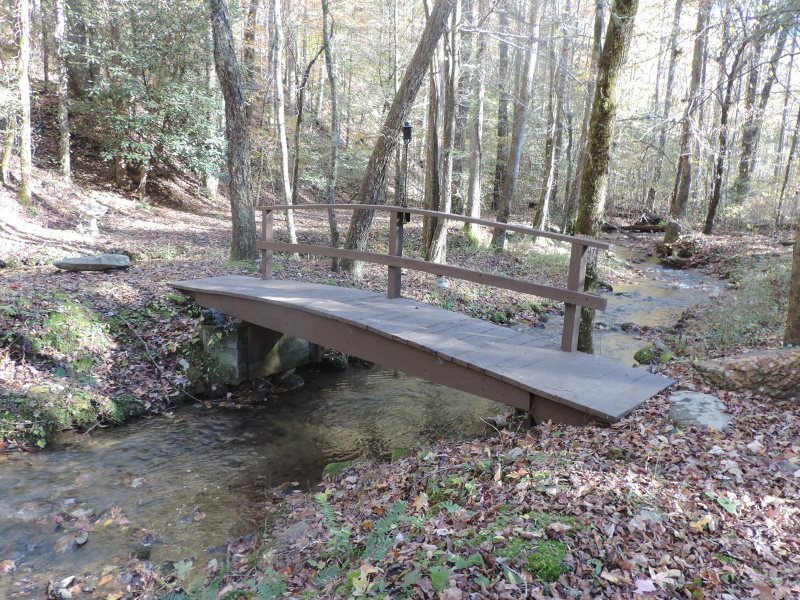 Close to Bear Creek Trail, the Gahuti Trail, Fort Mountain State Park Trails, and Mulberry Gap trails. Open living room with wood burning fireplace. Fully stocked Kitchen with 3 counter bar stools. Dining table seats 6 guest. Queen size Sleeper Sofa and Chairs in the Living room with a 42 inch Flat Screen TV. Wood Burning Fire Place in the Living room. Screened in back deck with table and chairs. Master Bed Room has a Queen sized bed with dresser. Door leads to screened in porch. Guest bedroom has a Full sized bed with dresser. 2 Single beds in the loft with bathroom. Cabin is on a Creek with Fire Pit and picnic table. This hiking trail is in walking distance from the cabin. Amenities: * Fully Stocked Kitchen * Microwave * Coffee Pot * Blender * Refrigerator * Toaster * Dish Washer * Dishes w/Utensils * Cooking Utensils * Pots and Pans * Washer/Dryer * Air Conditioning / Heat * WIFI Internet access * Private Back Deck * 1 Wood Burning Fireplace * Linens Provided * Hair Dryer * DirecTV * Phone *(Local Calls Only) * Pet Friendly* On a creek* Picnic table* Fire Pit* Porch swing * Secluded * Outdoor Hose for washing Trail Bikes and pets. GUESTS MAKING A RESERVATION MUST BE AT LEAST 28 YEARS OLD. BY SUBMITTING THEIR RESERVATION THEY ARE CONFIRMING THAT THEY ARE 28 YEARS OLD OR OLDER. NO LARGE GROUPS UNDER 28 YEARS OLD. MAXIMUM OF 6 GUEST THAT ARE 28 YEARS OLD IN ANY CABIN. Check-In and Check-Out Time: Guest acknowledges and understands that check-in time is not earlier than 4:00 PM, and check-out time is no later than 11:00 AM on the dates agreed upon. Guest agrees that an unapproved late check-out or early check-in will be assessed an amount equal to one-half of the nightly rental fee. Housekeeping needs the time between 11:00 AM and 4:00 PM to prepare for your arrival. RESERVATIONS: A prepayment of $250.00 of the rental fee, by valid credit card, will secure your reservation with the remaining balance due 21 days before arrival. The same credit card will be used unless advised otherwise. Directions will be sent via e-mail 1 week before you check in. If it is within the 21 day window, you will need to pay the total amount due. Guest agrees Cancelation Policy: To cancel your reservation you must email, call, or send us a request by mail to cancel. Each cabin listed on the Mountain Resort Cabin Rentals, LLC site is privately owned and cancelations affect the owners significantly. In the event of cancelation, the following will apply: •Reservations canceled more than 30 days prior to arrival, the full deposit of $250.00 will be returned minus a cancelation fee of $100.00. (This fee covers our cost for running your card and must be charged even if you cancel on the same day you book.) •Reservations canceled 22 to 29 days of arrival, a $250.00 cancelation fee. •For reservations canceled 21 days (or less) prior to date of arrival, the guest is responsible for the amount of the booking and your card will be charged in full.